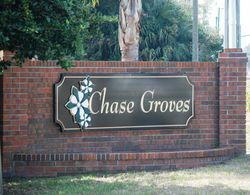 Chase Groves is a large and popular Lake Mary community consisting of approximately 825 homes ranging in size from just over 1000 sq ft to more than 3000 sq feet. The single family homes were developed between 1990 and 2002 by DR Horton and Moranda Homes. Centex built a townhome community in Chase Groves as well. While the entire community is named Chase Groves, there are several neighborhoods within it including Chase Crossings, Chase Pointe, Chase Ridge and the two townhome communities of Townhomes at Chase Groves and the newer Villas At Chase Groves. Many homes face lakes and ponds. Common amenities include tennis courts, a park and a playground. It is conveniently located near 46A and 417 which gives it easy access to I-4 as well. In addition, shopping and restaurants are nearby at Seminole Towne Mall and Heathrow’s Colonial Towne Park.